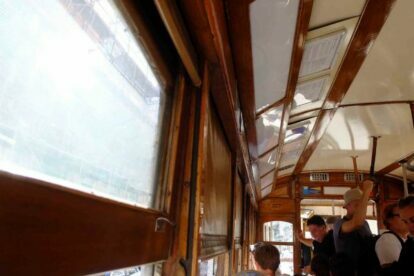 If you research a bit about Lisbon you are sure to find out about the historic Tram 28. It came from the US in 1901 and is to this day one of the most famous ways to get to know the city from hill to hill. Some even say it is a thrilling ride, like an old urban roller coaster, going up and down the super narrow streets and sometimes almost hitting boldly parked cars. The bad news is that, as it is so well known, it’s usually full of people and the waiting lines are huge. So let me suggest something shorter but worthwhile: wait until it’s almost 17:00 and catch it in Chiado (see the map for a stop in the shadow, good for waiting in hotter days). The trip is cheaper with the Viva card. Hopefully it will be less crowded, so try to sit by the window. Then, just relax, enjoy the view and listen to the “music” of it: the rails sizzling on the stops and turns, the people and noises in the streets, or even some seagull calling, disclosing the river nearby! If you want another soundtrack, put on your headphones and listen to this. One of our very dear Portuguese guitar masters. For me this is Lisbon also! And a great company. But don’t get distracted so you get out at Estrela. You’ll know it when you see the big church and please, be sure to pay it a visit. (check the Basílica article).